Another Friday has arrived and another start to a hot summer weekend with lots of outdoor festivals to enjoy! This weekend there are two festivals that I plan on going to - one is the annual craft beer and rib festival (which I only go to so that I can try out some new drinks since I'm obviously not interested in the ribs!) and the other is the jazz festival, which I'm looking forward to checking out since it will be my first time going. Since the food options at the festivals tend not to be very healthy or vegetarian-friendly, I still plan on cooking my own meals at home before heading out. That way, I don't have to worry about finding something I like to eat while I'm there, plus I can make the most of the summer produce that I plan on picking up from the farmer's market tomorrow morning! Last weekend, I came home from the market with a basket of gigantic jalapenos. 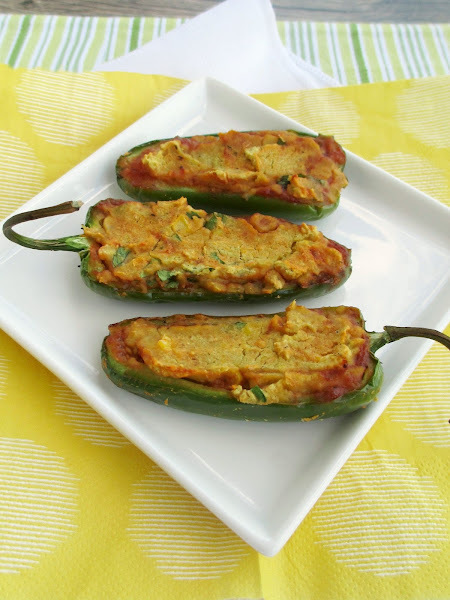 Since I knew I wouldn't be able to use them all up quickly enough, I figured I would make a dish where whole jalapenos were the starring ingredient, which is how I came up with this idea for stuffed jalapenos! 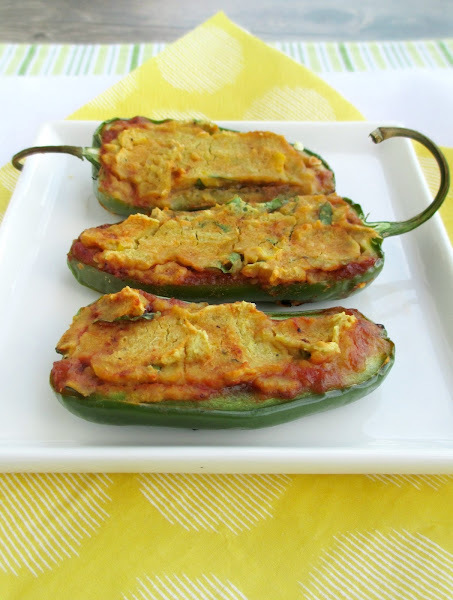 My mom used to make a version of cheesy jalapeno poppers in the summer, and I always avoided them because I was afraid they would be too spicy for me. Now that I'm much less afraid of spicy food, I'll happily indulge in a jalapeno popper and I'll laugh off the hiccups that result (hopefully I'm not the only one who gets hiccups from eating spicy food!). 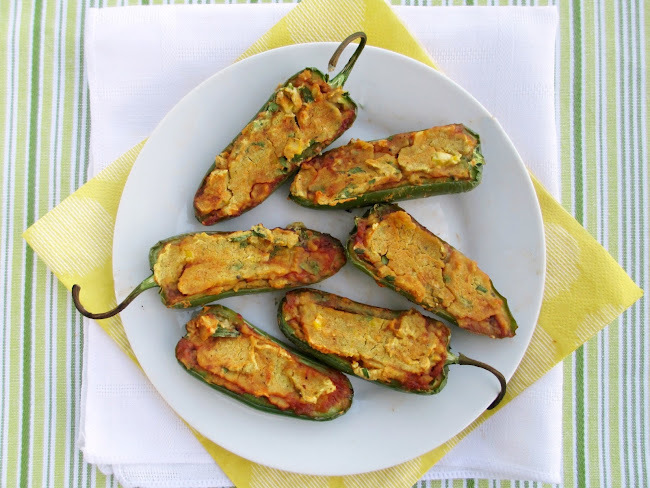 For my new version of stuffed jalapenos, I wanted to come up with a vegan option for a filling that doesn't use tons of cheese. I started wondering if hummus would work as a filling, and then I thought it would be even better to use a jalapeno flavoured hummus for even more heat! My first attempt at stuffing hummus inside whole jalapenos didn't turn out so well - the jalapenos didn't soften enough and I found there wasn't enough filling for the amount of jalapeno. The next time, I sliced the jalapenos in half first so that I could over-stuff them with hummus, and I also decided to add a layer of salsa to the filling to cut down the richness of the filling a bit. My second attempt turned out just how I wanted! The jalapenos were nice and soft and lightly charred, and I liked how the hummus formed a slightly hardened crust on top while staying soft and gooey underneath. I thought the corn-jalapeno hummus recipe from How Sweet It Is that I used was the perfect choice since it was full of flavour and I even added bits of corn kernels for a little texture. This was definitely a hot and spicy dish from the combination of jalapenos, salsa, and jalapeno hummus. My mouth was on fire the whole time I was eating them (and for quite a while afterward), but I've heard that spicy food is the way to go when it's hot outside, so these would be the just the thing to make this weekend! *For the hummus recipe, I used one whole cob of corn. After cooking the corn, I measured out half a cup to puree in the hummus, and stirred in the remaining kernels. 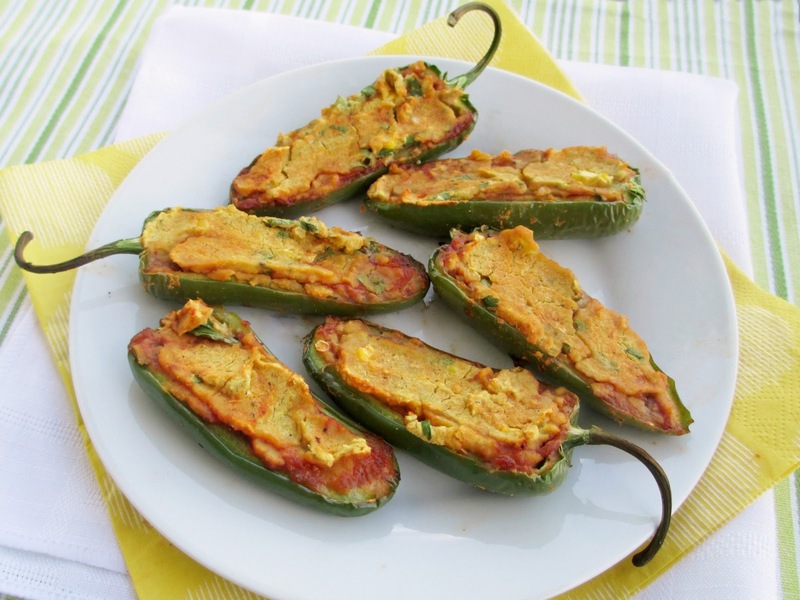 Slice jalapenos in half lengthwise. Carefully remove the inner stem and seeds with a knife so that you are left with eight hollow shell halves. Place on a baking sheet, hollow side facing up. Measure about ½ cup of the hummus and stir in the chopped cilantro (save the remaining hummus to eat later). Spoon about 1 tsp of salsa into each jalapeno half. Top with a spoonful of the hummus mixture, spreading it with a spoon to evenly cover the whole surface of the jalapeno. Add enough hummus so that it is slightly heaping over the jalapeno (you may not need to use the whole ½ cup of hummus, depending on how big your jalapenos are and how much filling you want to have in each one). Bake in the preheated oven for 20-25 minutes, until the jalapenos are softened and browned on the bottom, and the hummus is slightly hardened and browned on top. Remove and let cool slightly. Makes 2-4 servings (8 jalapeno halves). Yum! Great idea! :) I love stuffed jalapeños. Hummus would make a delicious stuffing for them!